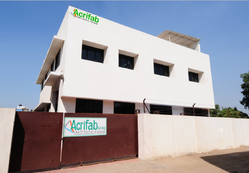 Established in the year 2007, we, “Acrifab Pvt Ltd.” are a reputed firm engaged in manufacturing, supplying and exporting Inspection & Measurement System. We also provide installation services for our products. All our offered range of products are fabricated by a team of dexterous professionals following the international standards. 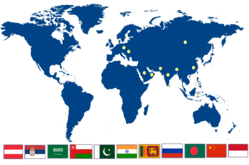 The experts of our firm make use of advanced technologies and production techniques to design the offered range of products. Moreover, to ensure that flawlessness, these are tested on various parameters by the quality analyzers. All our products are easy to install and provided with user friendly operations. We are a customer-focused firm, which strives work towards achieving the maximum contentment of the valuable patrons in the best possible manner. Our sincere professionals maintain a close relationship with the clients to understand their exact requirements and offer products accordingly. Further, we have installed high grade machines and equipment in our production unit that helps us in meeting the variegated demands of our clients with utmost ease. Owing to our transparent trade policies, ethical business practices and sprawling infrastructure facilities, we have been able to gain the faith of numerous patrons across the nation. Under the able guidance of our mentor, 'Mr. Bhavesh', we have been able to achieve a commendable position in the market. His in-depth knowledge, constant motivation, business acumen, brilliant managerial skills and zeal towards achieving all the business tasks in an efficient manner have enabled us to reach the pinnacle of success. Since commencement, we have had our main focus towards the quality aspect of our manufactured products. Our sourcing agents ensure that the raw material for the offered range of products is procured from from reliable vendors only. These procured raw material is optimally used by our experts to make the offered range cost-effective. Moreover, to ensure the compliance of our products with international quality standards, these are tested on various grounds by our quality analyzers. "Acrifab Pvt. Ltd. aims to provide complete automation solutions and best system integrator, and become the leading company in the Field of Machine Vision." We are blessed with a team of dexterous professional, which works in sync with one another to carry our all our business related activities in a streamlined manner. All these professionals are well versed with the pros and cons of the market. Further, we have appointed a team of highly qualified quality analyzers who test our manufactured products on various parameters to ensure their compliance with industry guidelines. 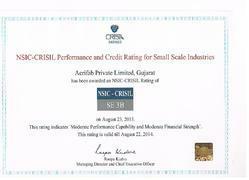 This rating indicates ‘Moderate Performance Capability and Moderate Financial Strength’. Our products cater to diverse visual inspection needs of the automotive industry like Wheel Inspection, Assembly Adhesive Inspection System (6:48), Color Fuse Inspection, Console Faceplate Inspection, and Registration Marking Identification Application. Some of the applications our vision systems meet in electronics & semiconductor industry are Chip Capacitor Inspection, Connector Assembly Inspection, Image Stitching, Lead Frames Inspection, Universal Pin/Contact Inspection, and Pin Tips and Solder Tails Inspection. We cater to the narrow visual inspection needs of medical & pharmaceutical industry. Our systems are suitable for Dialysis Filter Inspection, High Precision Needle Inspection, Needle Inspection with Image Stitching, Needle Inspection with Image Stitching, and Rotating Glass Vials Inspection. Our inspection systems are primarily used in packaging units to ascertain uniformity and to detect flaws in packaging. The systems are used for Can Contents Verification, Digital Wheel Print Quality Inspection, Label Stack Verification, Caulk Container Inspection, and Part Placement Verification. Fastener Inspection, Stamped Part Feature Verification, Plastic Extrusion Inspection, and Laminated Conductive Polymer Materials Inspection. 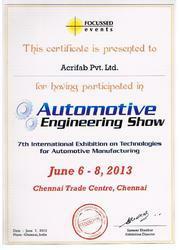 This certificate is presented to acrifab private limited for having participated in automotive engineering show 7th international exhibition on technologies for automotive manufacturing june 6-8,2013 chennai trade centre, chennai. Being a client-centric organization, we work towards maximum satisfaction of our clients in the best possible manner. All our products are manufactured using premium quality raw material and advanced technologies at our premises. Moreover, our team of experts maintain a cordial relationship with the patrons to take their valuable feedback and suggestions and make changes, in necessary. Further, we ensure that all the orders consignments reach the clients'''' destination within the promised time. Owing to our on-time deliveries and qualitative products we have been able to muster a huge clientele for ourselves.